Natalia Surzenko, PhD joined the NRI in 2013. Her studies focus on understanding how nutrient availability during pregnancy affects brain and eye development. 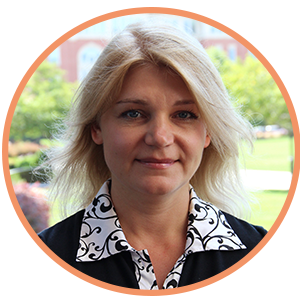 Dr. Surzenko received her PhD in Neurobiology from the University of North Carolina at Chapel Hill. Her graduate research was focused on elucidating the molecular mechanisms of neural progenitor cell maintenance. During her postdoctoral studies at the Department of Genetics at Harvard Medical School, Dr. Surzenko investigated the strategies employed by neural progenitor cells of the retina to generate neuronal cell diversity. At the NRI, Dr. Surzenko combines mouse genetic tools with a variety of cellular and molecular assays to assess the roles of distinct nutrient compounds in the regulation of neurogenesis in the developing central nervous system. 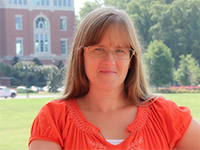 Carolyn Munson graduated in 2015 from Rowan Cabarrus Community College with an AAS in biotechnology. She is working as a research technician in the Surzenko Lab at the NRI. Much of her work is directed by Dr. Natalia Surzenko performing immunohistochemistry work.